Every piece of research should be carried out according to certain standards and meet specific requirements. You should follow a few rules to be able to write a good academic essay. You should keep in mind that such type of an essay requires a lot of preparation and also some experience in the field you are writing. On the other hand, it is not that hard to write an academic essay. Don’t think it is a PhD dissertation or a treatise. Define the topic and scope of your work very precisely. Think how you can perform your task taking into account important facts or conceptions. You need some time for that (it depends on your learning and reading style). Ask your professor/s for bibliography: then you can go to the library and borrow the required books. If you rely on the internet, be careful with Wikipedia and other web sites which can contain false or partial information. Just keep in mind that if you run out of time, you can simply narrow your scope and refer to less facts and information. At any rate, good preparation means a good essay. Not every academic essay turns upon a thesis (it may include observations or description of phenomena). In all cases, your academic essay should be based upon a hypothesis which will need further elaboration throughout the paper. Express your opinion on the subject; the thesis can be two or three sentences long; otherwise, your reader will be bored. Rely only on reliable research and refer only to facts. The arguments should also be related directly to your thesis. At least three arguments will be needed to justify your thesis. If possible, refer to counter-arguments (counter-hypothesis) in order to present the current debate on the topic. Never ignore information which can contradict your thesis. Use a valid reference style: MLA, APA, Chicago, Harvard style, and so on. You don’t need too many quotes. All you need is to refer to a given source of information. Every single time you refer to a theory, a conception, a fact, and so forth, you should indicate the source you have used. The total length of quotes should not exceed 15-20% of the length of the paper. Remember: your instructor wants to check your ability to write an academic essay. Don’t quote too much! The total length of quotes in an academic essay should not exceed 15-20% of the length of the paper. 1. Abstract (not necessary) - summarizes the content. 2. Introduction - introduces the topic, the context of research, the thesis and methodology. It may include some of the arguments or counter-arguments. 3. Body part - comprises the re-stated thesis and all the arguments. Although this is the essential part of every essay, it should be connected with the introduction in a logical way, not to be isolated as a separate block of text. 4. Conclusion - it summarizes the thesis and the arguments, but also shows the perspectives for further research. Some conclusions reflect the self-critical attitude of the author (for instance, he/she indicates the flaws of the thesis defended in the paper). 5. Bibliography - it contains sources that are quoted or referred to in the paper. It is formatted according to the reference style applied by the author. Academic essay structure: 1) abstract; 2) Introduction; 3) Body part; 4) Conclusion; 5) Bibliography. The essay is not still ready. Now it needs proofreading. Ask a friend to give you a feedback, and then revise it accordingly. Read it two times before giving the essay to your instructor. 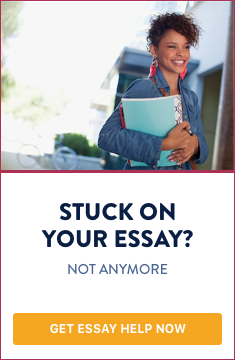 Do you need help with writing an academic essay?